Silent Bidding Online has closed. The galleries will be left up for auction attendees to be able to see the items. Thank you all for submitting your silent bids! That’s Right the time has come once again to rid yourself of clutter and get yourself some Store Credit! We will be taking material at ALL locations starting Thursday September 11th and through Tuesday September 16th. We will, once again, have a week of Online Silent Bidding leading up to the auction as we have for the last few auctions. Silent Bidding Online begins Monday September 22nd and runs through Friday September 26th. The actual auctions occur at The St. Charles store and will be on Saturday September 27th at Noon where we will feature All Miniatures Games, and at 5pm where we will feature Role Playing Games and all accompanying material and on Sunday September 28th at 1pm we will feature Board Games and Other Gaming! 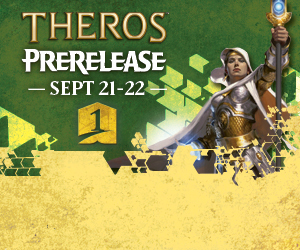 The plane of Theros is ruled by a pantheon of all-powerful gods. Krakens, minotaurs, and other monsters threaten the safety of walled cities. Heroes rise to battle, bolstered by their devotion to the gods. Theros is a very dangerous land outside of the walled cities Meletis, Akris and Setessa. Nyx is the night sky, and home of the gods, it moves around each night. The five Gods are: Heliod, Erebos, Nylea, Thassa, and Purphoros. The gods can take multiple forms and walk among mortals. The planeswalker Elspeth Tirel will fight a Hydra and attracts the attention of Heliod. Elspeth doesn't want to be a hero and does not believe she will be called on to be a leader in a world of gods. Minotaurs are the rampaging savages of Theros. Back Issue Sale THIS WEEKEND! You read that right! The 4th Annual Fantasy Shop Halloween Back Issue Sale is this weekend! That means that all 4 locations will have their regular stock back issues (priced $10 or less) for just $1 a piece! The Saint Charles store will have all the warehouse stock out on the floor and priced at just $0.25 a piece! And, once again, if you come into the stores dressed in costume you can enter the costume contest (with a 13 and older category and a 12 and under category) AND get $5 in FREE back issues! That's 20 comics at the Saint Charles store! 20 FREE COMICS! Just for showing up in costume (The Fantasy Shop Employees hold the right to determine what is, and isn't a costume). 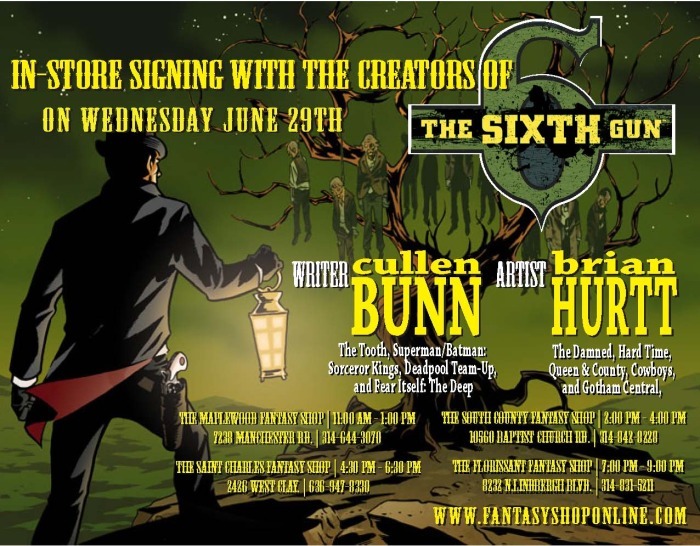 Signing with Brian Hurtt & Cullen Bunn!